Burton High Fives 2014: Slopestyle Highlights ← shralp! Let’s start having World Snowboard Tour contest. The Burton High Fives is a 5Star event at Wanaka’s Cardrona Alpine Resort. Jamie Anderson (USA) won the women and Emil Ulsletten (NOR) won the mens Slopestyle. 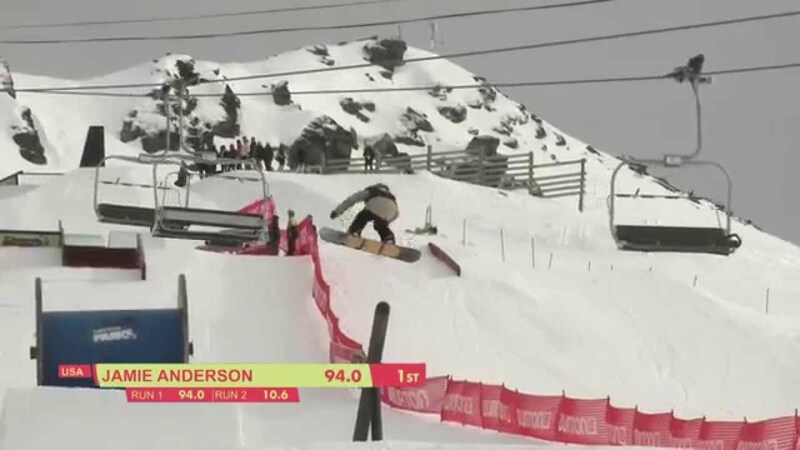 Sochi gold medalist Jamie Anderson set the bar high for the women right from her first run where she linked a Frontside wallride to a Backside Noseslide into a Backside Tailslide, 50-50 Backside 180 out off the cannon rail into a Cab 540, Frontside 360 and a huge Backside 540 to finish with a 94.00. Taking second place was Burton rider Miyabi Onitsuka (JPN) who scored an 87.80 on her run that included a highly technical Cab 270 Boardslide to Regular through the tricky rail section. New Zealand local and team captain Christy Prior (NZL) rounded out the podium with a run that showcased her signature Frontside Rodeo 540 and earned her an 86.80.